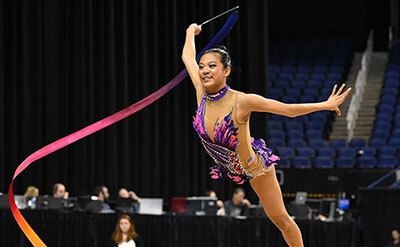 GREENSBORO, N.C., July 6, 2018 – 2016 Olympian Laura Zeng of Libertyville, Ill./North Shore Rhythmic Gymnastics Center, won the senior clubs and ribbon titles at the 2018 USA Gymnastics Championships at the Greensboro (N.C.) Coliseum Complex. Elizabeth Kapitonova of Staten Island, N.Y./Isadora Rhythmic Gymnastics, successfully defended her junior all-around title at the national championships, which conclude tomorrow for acrobatic gymnastics, rhythmic gymnastics, trampoline, tumbling and double mini-trampoline. Zeng took top honors for both the clubs and ribbon. For clubs, Zeng posted a 17.717, edging out Camilla Feeley of Highland Park, Ill./North Shore Rhythmic Gymnastics Center, at 17.100. Nastasya Generalova of Los Angeles/California Rhythms, was third with a 16.367. Zeng’s ribbon score was a 16.617 for the title. Feeley and Generalova tied for second at 15.900. Zeng leads the senior preliminary all-around rankings with a 70.001 total. Evita Griskenas of Orland Park, Ill./North Shore Rhythmic Gymnastics Center, is second in the all-around rankings at 67.451. Feeley completes the top three at 66.818. Kapitonova swept the junior rhythmic gold medals, winning the all-around (61.185), hoop (15.917), ball (15.850), clubs (14.984) and ribbon (14.434). Lennox Hopkins-Wilkins of Puyallup, Wash./Evergreen Rhythmics, was second in the all-around (57.284), with Matylda Marszalek of Highland Park, Ill./North Shore Rhythmic Gymnastics Center, in third (53.818). The U.S. junior group of Anastasiya Ivanova, June Kim, Alexandra Militeeva, Valerie Militeeva, Vianna Ngo, and Ellen Peng, all of San Diego, Calif./Emerald City Academy of Rhythmic Gymnastics, earned an 18.450 for a combined routine total. For the two-event all-around, the senior group of Dasha Baltovick of Highland Park, Ill.; Isabelle Connor of Manhattan Beach, Calif.; Ugne Dragunas of Darien, Ill.; Connie Du of Deerfield, Ill.; Elizaveta Pletneva of Caldwell, N.J.; Nicole Sladkov of Vernon Hills, Ill.; and Kristina Sobolevskaya of Deerfield, Ill., who train at North Shore Rhythmic Gymnastics Center, won the group all-around title with a 31.000. The evening session served as the preliminary round for women’s trampoline and tumbling and men’s double mini-trampoline. The gymnasts leading the senior rankings for the prelims are: men’s double-mini – Matthew Hawkins of Phoenix, Ariz./North Valley Gymnastics (75.300); women’s trampoline – Nicole Ahsinger, Lafayette, La./Trampoline and Tumbling Express (100.250); and women’s tumbling – Eliza Floisand of Salt Lake City, Utah/Wasatch Trampoline & Tumbling (67.600). In acrobatic gymnastics, Emily Davis and Aubrey Rosilier, both of San Antonio, Texas/Acrobatic Gymnastics of San Antonio, earned a women’s pair balance routine score of 28.680 (56.410 two-routine total), and Angel Felix, Moreno Valley, Calif., and Braiden McDougall, Riverside, Calif./Realis Gymnastics Academy, posted 27.470 for balance (53.890 two-day total) for senior men’s pair. The mixed pair of Emma Fitzgerald of Placerville, Calif., and Nathaniel Davies of Rocklin, Calif./Capital Acrobatics, earned a 25.000 for the balance routine (50.180 two-day total). In women’s group, Elanor Chang of Columbia, Md., Calista Davis of Ijamsville, Md., and Madison Freed of Mt. Airy, Md./Emilia’s Acro Gymnastics and Cheer, grabbed a 27.130 for the top dynamic routine and a two-day 55.070 total. The men’s group of Sean Butehorn of Mt. Airy, Md., Daniel Disman of Clarksville, Md., Grant Shields of Columbia, Md. and Sean Shields of Columbia/Emilia’s Acro Gymnastics and Cheer, took a 27.210 for the dynamic routine (53.83 two-day total). Aisley Boynton of Riverside, Calif., and Sean Obley of Mesa, Ariz., Realis Gymnastics Academy, withdrew from competition after Obley injured an ankle. The junior 13-19 acrobatic squads who had the top scores for their event were: mixed pair – Carina Newlin and Dorian White, both of Castro Valley, Calif./WestCoast Training Center, balance, 26.360 (combined total 53.170); and women’s group – Marisa Gatson of Severn, Md., Olivia Strublenof Laurel, Md., and Micah Whiteman of Columbia, Md./Emilia’s Acro Gymnastics and Cheer, dynamic, 26.810 (51.830 combined total). Top three senior rhythmic gymnasts, clubs final: 1. Zeng, 17.717; 2. Feeley, 17.100; 3. Generalova, 16.367. Top three senior rhythmic gymnasts, ribbon final: 1. Zeng, 16.617; 2. Feeley, and Generalova, 15.900. Top three senior rhythmic gymnastics, all-round preliminary rankings: 1. Zeng, 70.001; 2. Griskenas, 67.451; 3. Feeley, 66.818. Top three junior rhythmic gymnasts, clubs final: 1. Kapitonova, 14.984; 2. Marszalek, 14.384. 3. Shannon Xiao, Fairfax, Va./Gymnastics World, 14.300. Top three junior rhythmic gymnasts, ribbon final: 1. Kapitonova, 14.434; 2. Hopkins Wilkins, 14.017; 3. Isabelle Richardson, Las Vegas, Nev./Eurogymnastics, 12.950. Top three all-around junior rhythmic gymnasts: 1. Kapitonova, 61.185; 2. Hopkins-Wilkins, 57.284; 3. Marszalek, 53.818. Hopes rhythmic gymnast, all-around champion: Vernonica Portnov, Feasterville, Pa./Iliana Rhythmic, 42.918. Top three women’s qualification scores: 1. Ahsinger, 100.250; 2. Savannah Thompson, Scott, La./Trampoline and Tumbling Express, 100.235; 3. Alyssa Oh, Rocklin, Calif./World Elite Gymnastics, 100.100. Top three women’s qualification scores: 1. Floisand, 67.600; 2. Hope Bravo, Dallas, Texas/Eagle Gymnastics Academy, 66.200; 3. Gretchen Schultz, Destrehan, La./Elmwood Gymnastics Academy, 64.500. Top three men’s qualification scores: 1. Hawkins, 75.300; 2. Ruben Padilla, Oakley, Calif./Tornado Sport Club, 72.700; 3. Drake McMullen, Carl Junction, Mo./Amplify Gymnastics, 70.000. Mixed pair, balance: 1. Fitzgerald and Davies, 25.000 (50.180 combined); 2. Boynton and Obley, withdrew due to injury. For the junior and senior elite levels for each discipline, the athletes will vie for national titles. Performances in Greensboro also will determine berths on the junior and senior U.S. National Teams for acrobatic gymnastics, rhythmic gymnastics and trampoline and tumbling. For rhythmic gymnastics and women’s trampoline, the competition will be part of the selection process for the Youth Olympic Games. The Junior Olympic division has several different levels, and national titles will be awarded for each level and age group for each discipline. Evening session tickets at the Greensboro Coliseum are $40. A $35, single-day pass will be available onsite on competition days.